For my family, there are two major holidays: Christmas and Easter. 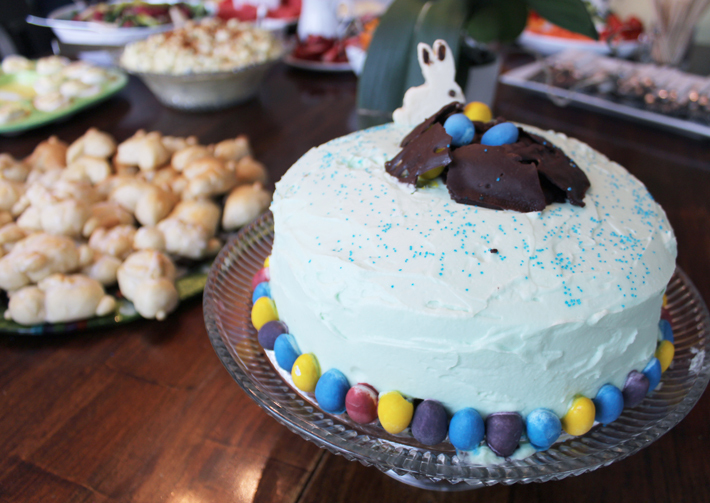 Every year for Easter, we’ve usually gone to my brother and sister-in-law’s house with the rest of my husband’s family. As the years have passed, more and more children have been added to our family’s brood. At this time the family currently have seven grandchildren, all birthed within the last six years.. Ha! 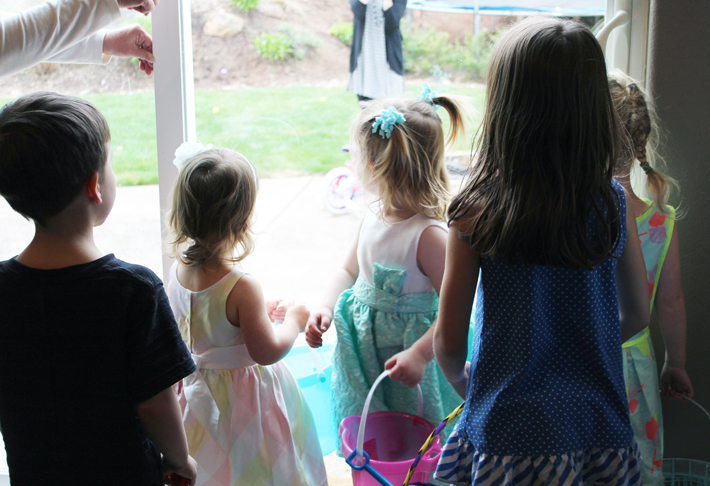 So due to nap times and transitions, I seriously appreciated the opportunity to host Easter this year in our new home. Now, to preface the importance of what it means to “get” to host this holiday: The Carey’s are competitive. This is something I have quickly learned over the last 9 years. My sister-in-law is awesomely competitive, in the best way. Well, let’s just say this attribute “scored” her the family’s annual Easter party. When she made a comment a few months ago about not being sure about hosting Easter this year due to different things, I offered to host at our house just as long as I could get some help (there was NO way I was going to be responsible for the Easter ham.. no way) and that was settled! Yes!! 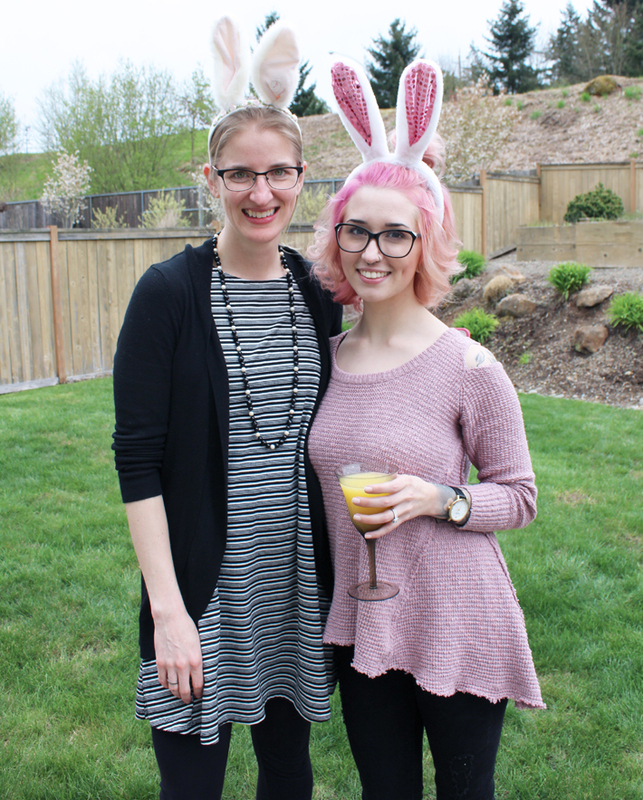 I had a personal goal to impress my sister-in-law with Easter this year. She always does such an amazing job and I really didn’t want to disappoint! 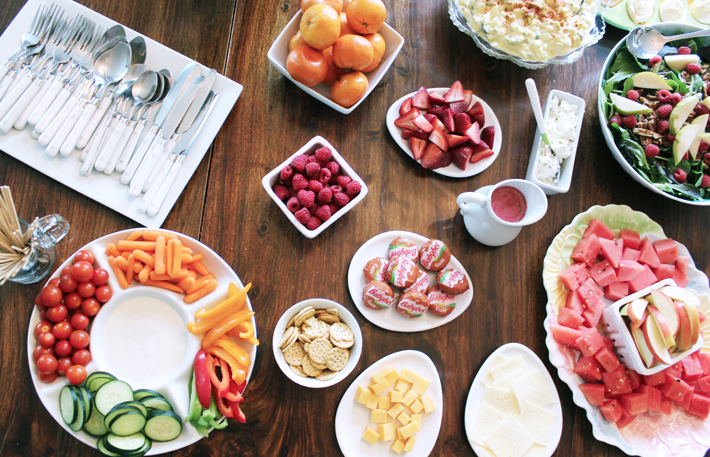 I was in charge of decor, fruits, veggies, salad and beverages while the potatoes, ham and desserts were divvied up to others. I took to Pinterest to pin all the Easter things and visited my local stores to snag some inexpensive Easter decor. Thinking about how first impressions matter and I really wanted to nail the “essence” of Easter, I used my kids’ chalk to decorate our entryway outside. 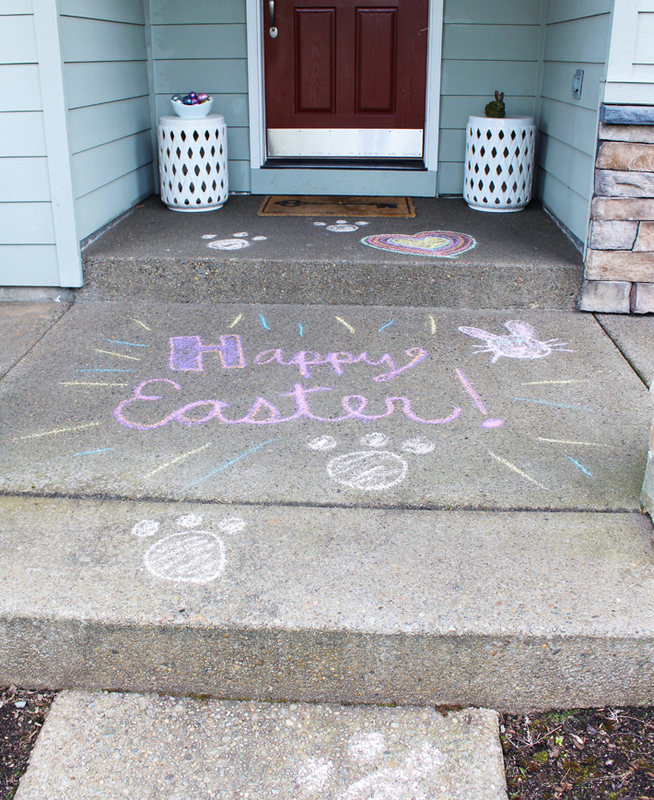 I wrote “Happy Easter!” and even drew little rabbit footprints up the walkway! So cute and the kids all loved it! I even found some small tulips on sale at my local grocery store and picked some up for our front room!! 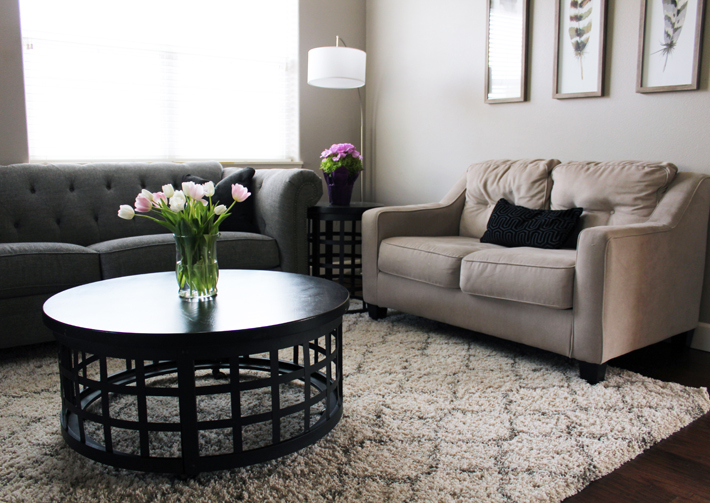 I really feel like it allowed this space to get a spring and Easter vibe with class subtlety. I had other small themed decor in this room but knowing that most people would be spending their time in our other living space and out back, I didn’t put too much effort here. Now for the food.. Even though the items I was in charge of were “easy”, I found ways to still make them look cute! 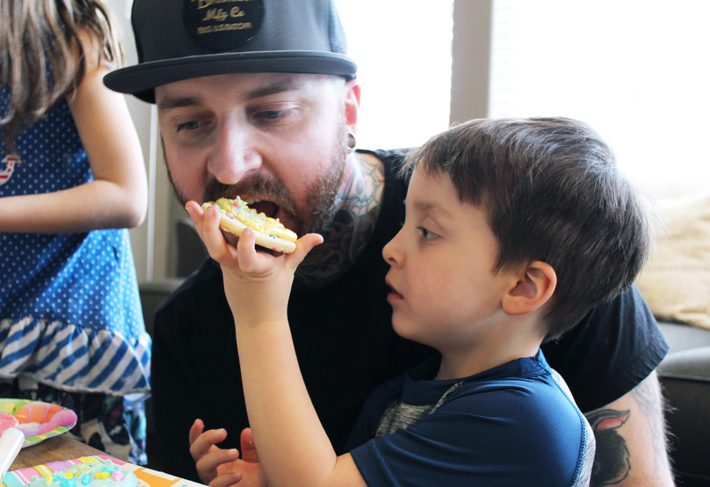 For the most part, each of our little families prefer to eat on the healthy side for the kids. I made sure to include lots of different fruits (raspberries in a cute ceramic dish, cut up apples stored similarly in a bed of watermelon, Cutie oranges and more. I even found some adorable egg-shaped plates in the dollar section of Target! My son LOVES cheese and I knew he would be too picky for our Easter menu so I made sure to include some yellow cheese (he’s lactose intolerant) along with other cheeses *I* wanted to eat (Gouda and Havarti are my favorites!). I found an amazing salad recipe on Pinterest that was easy enough for someone like me to accomplish yet still feel like I made something extra fancy. I mean, a raspberry-pear salad with pecans and goat cheese?? It just sounds exceptional. Best part? It was a hit. Yes! 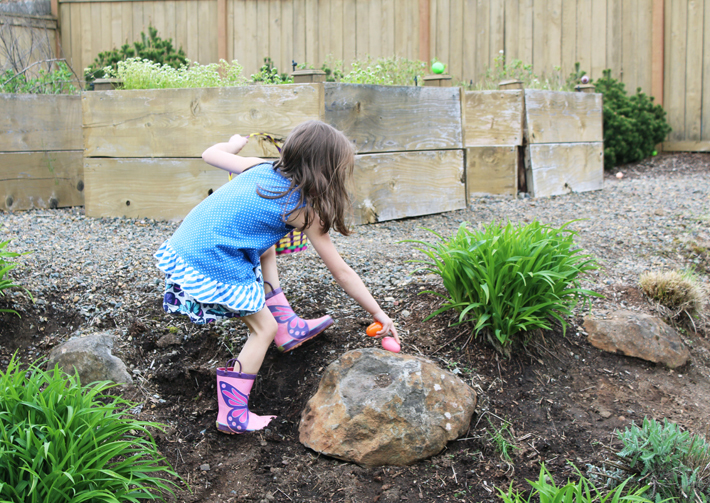 After we ate way too much food, we let the kids do their Easter egg hunt in the backyard. My husband was SO excited to have it at our house this year because of how many fun hiding spots in the many bushes, garden boxes, trampoline, etc. The kids (and adults!) had a blast! 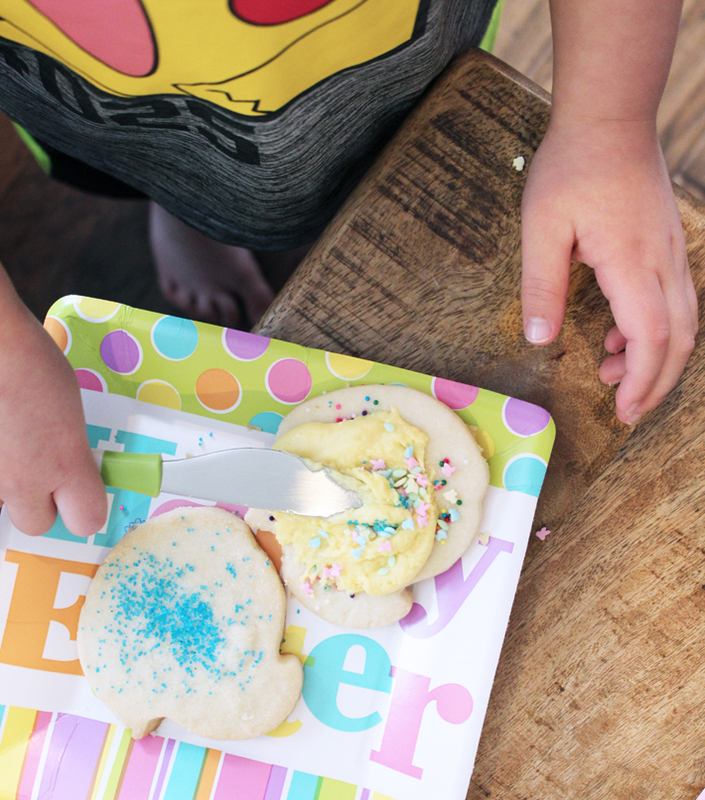 Last, but not least, the kids decorated some yummy Easter-themed cookies with a plethora of different sprinkles. When I was talking to Tiff about what to do for Easter, I asked her if there were any traditions she wanted to keep, or start. After a moment, she remembered that she and her siblings would decorate cookies each Easter when they were little and that maybe she’d like to start that each year. As someone who LOVES sugar and decorating, that was an obvious “YES!”. Between myself, Tiff and my mother-in-law, we had quite the selection of sprinkles and frostings. What a seriously fun way to finish up our time together!